Industrial Machinery Company is proud to be an authorized Dealer for Cidan equipment. Cidan is known in sheet metal circles for being the top of the line for metal fabricating equipment. 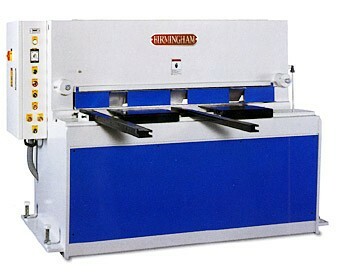 If you need a shear for sheet metal Cindan’s quality is second to none. Call us today and let us help you add Cidan to your growing fabricating business. If you are working with light to medium plate and are in need of a shear, Industrial Machinery Company has you covered. When it comes to buying equipment there are generally two options. Buy quality and pay the price or buy cheap,and pay more. Once time is wasted it can never be regained. You might save money somewhere else on the project but the time itself is gone. There are few exceptions to the two rules however, like this little gem of a shear. The Birmingham 1/4″ x 10′ shear is a high quality machine at an affordable price. It will serve you for years to come. Cutting your jobs down to size and speeding your projects out the door. If you are working with heavier plate, Industrial Machinery Company can also meet your need as well. Standard Industrial make a line of shears for heavier plate starting at 1/2″, 5/8″, 3/4″, 1″ and tey make one for, 1-1/4″ and one capable of shearing up to 1-1/2″. So do not be afraid of cutting things down to size. If you are in search for a large shear give us a call.